Mangaluru, Dec 3, 2017: The Confederation of Real Estate Developers Association of India (CREDAI) Mangaluru Chapter gave away scholarships to 20 children of construction workers from this academic year. Speaking to reporters Dec 2, Saturday, Credai Mangaluru Chapter President D B Mehta said that students welfare has been a priority and as a part of its commitment towards the education of the poor and needy, Mangaluru chapter of Credai has decided to provide scholarships. The number of children who receive scholarships will be increased to 100 in the future. The scholarships are being given on a merit basis to ensure that the children of labourers do not end up as unskilled labourers and instead continue their studies. 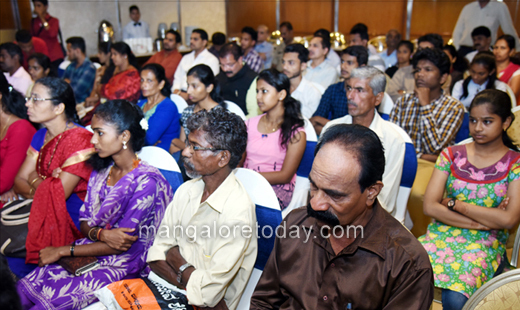 Skill training: Stating that Credai has started skills training programme for construction workers across the country in line with the Pradhan Mantri Kaushal Vikas Yojana (PMKVY), D B Mehta said that two batches of labourers have already been trained in Mangaluru. Atleast 500 workers will be trained in skills at construction sites this year. Credai is taking this initiative across the country through its member developers. The training programme will impart ‘On-site training’ to the construction workers which will help in developing technical skills and safety awareness. The candidates who successfully complete and pass the training programme will be certified and rewarded as well. The skill training will ensure higher remuneration for the workers as well, he said. He also said that the Credai Mangaluru chapter has ensured that all the construction labourers on site of Credai members are registered with the labour welfare board and have identity cards to take up the benefit from the government. Karnataka Building and other Construction Workers’ Welfare Board is collecting 1% of the project cost from the employer as cess. According to the Building and Other Construction Workers’ Cess Act, 1996, the amount should be utilised to meet the expenses related to education, health and marriage of the family members of the workers. Around Rs 100 crore collected from Mangaluru is with the Labour Welfare Board. Smart classrooms: To improve the facilities in government schools, Credai in association with Mangaluru Round Table and Ladies Circle have initiated smart classrooms in government schools at Mannagudde, Panjimogaru and Bikarnakatte. The work on smart classrooms at government school in Bokkapattana and Deralakatte will be completed shortly. To raise funds for CSR activities, Credai Mangaluru has rented its own office and shifted to a rented building, said D B Mehta. Making observations after distributing scholarships to students, MLA J R Lobo called upon Credai Mangaluru to help in the construction of anganwadi centres in Mangaluru city as the government does not sanction funds for the construction of anganwadi centres in the city. He also said that Credai can help in the construction of toilets in schools where girl students are a majority.